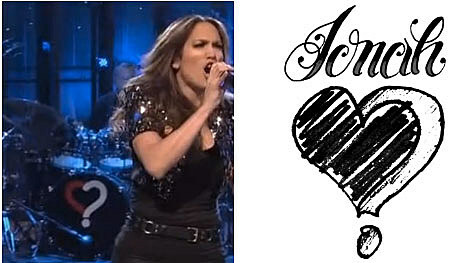 Right after Jennifer Lopez played on SNL a little while ago, I [Jonah Matranga] got a bunch of messages from people saying she’d used the heart/question mark image that I’ve been using for many years. Lots of you said I should sue to stop ol’ J-Lo from using it further or whatever. I thought it was kind of a bummer that she used it, but pretty funny overall. Mostly, I didn’t think that I would have the money or time to deal with whatever high-powered management and lawyers J-Lo has, so I kinda wrote it off as one of those weird things that happens. Then, a friend who knows about Intellectual Property law got in touch and said I actually do have a valid case. It turns out her new album will be called ‘Love?’, so it seems like the image might be used by her a whole lot more. When I think about it, I would rather that she didn’t use this image that I’ve come to enjoy so much. I have it on so many albums, posters, shirts. I draw it when I sign stuff for people, I have a tattoo of it, many of you do as well. I’m not sure what the image means to you, but it has come to mean many things to me over the years. One of those things is simply, ‘I love ideas’. Anyway, I asked some lawyer friends about what I could do to stop her. I’m putting some stuff together (album covers, etc) to show that I’m a legitimate artist whose art, image and community she’d be messing with. Here’s where you come in: I’ve also been told that you can help out by sending photos of ways you’ve used the image in your life, after you found it through my music. So, if you have a tattoo of it, or you’ve made drawings of it, or you have anything at all that shows the many ways the little heartquestion has gotten out there, I’d love to see it, and so would the lawyers. You can post your pics (or links to them) here, or send them via any number of internetty ways, or just mail ’em to me. I have no idea what will happen from all this, but it seems as good an excuse as any to gather this stuff together and remember the power and fun of making stuff and putting it out into the world. Please pass this on to anyone who might be interested.